Q: What are the customs of the festival of Chanukah? A: The festival of Chanukah is celebrated for eight complete days. 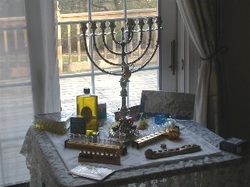 The lighting of the menorah is the symbol most commonly associated with Chanukah. The flames should burn for at least a half hour after it gets dark. In many communities, it is customary to eat dairy foods on Chanukah. We also eat foods cooked in oil such as potato pancakes or donuts. Children play the dreidel game. It is also customary to give money or gelt to children. We say an additional prayer at this time telling of the miracle that happened at this time of year. Al Hanissim "For the Miracles", is added in the Amidah prayer and in the Grace after meals. A full Hallel is said every day during the festival. The portion of the Torah that is read during the week tells of the dedication of the Tabernacle by Moses in the wilderness. It is also customary to give charity on the festival of Chanukah. A: Hallel is an additional service that was instituted by the prophets. It is comprised of a series of psalms and praises to the Almighty. It is a service that is to be recited on the festivals Sukkot, Passover, Shavuot and the celebration of the new month Rosh Chodesh, and times when Israel is saved from harm. It was recited by the Israelites at the splitting of the Red Sea, at the defeat of the king of Canaan by Joshua, after the defeat of Haman by Mordechai and Esther. These psalms contain five fundamental concepts of Jewish faith; the Exodus, the splitting of the Red Sea, the giving of the Torah, the future resuscitation of the dead, and the coming of the Messiah. It is not recited on the days of judgment like Rosh Hashanah and Yom Kippur. It is not said on Purim because despite the victory the Jews still remained servants. However, on Chanukah the victory was complete. Q: What happened on Chanukah? A: Over 2,000 years ago the Syrian-Greek king Antiochus IV refuse to allow the Jewish people in the Holy Land to observe the commandments. Antiochus defiled and disgraced the holy Temple in Jerusalem. The Maccabees, a small band of families, fought against the Greek tyrants. Matityahu, leader of the Maccabees, and his sons, led a successful revolution against Antiochus. Our tradition describes the many miracles that occurred on the day the Maccabees won. When the Maccabees entered the Temple, they found only a one-day supply of pure oil. The miracle was that this cask of oil, which held a one-day supply, lasted for eight days. This was enough time to produce a new pure oil. Q: When does the festival of Chanukah begin? A: The festival on begins on the 25th day of Kislev (the third month of the Jewish calendar). We kindle the first flame at nightfall. On the night of the 26th, we light two flames, and so on for eight nights. Q: What is a shamesh? A: According to Jewish law, we are not allowed to use the Chanukah candles for any purpose, such as to provide light for reading. Therefore, a separate candle, not one of the eight, is set aside to light the others. The shamesh may be used for all purposes. The word shamesh means "helper". Q: We light candles ever Friday night. Which candles do we light first that night; the Chanukah candles or the Shabbat candles? A: The lighting of the Shabbat candles mark the beginning of the day of rest. If we were to light the Shabbat candles first, we would not be permitted to light the Chanukah candles. Therefore, prior to sunset on Friday we first light the Chanukah candles and then we kindle the Shabbat candles. Q: On Saturday night, at the conclusion of Shabbos, which do we light first, the Chanukah candles or the Havdalahcandle, which symbolizes the separation of the Sabbath from the rest of the week? A: The Havdalah candle represents the Sabbath past, while Chanukah candles each night represent the following day. At Sabbath's end, we first light the Havdalah candle, then the Chanukah candles. Q: Where do we light the Chanukah candles? A: Our sages teach us that every household should have at least one menorah. It is customary to light a Chanukah menorah in the synagogue. Lighting Chanukah candles in the synagogue does not remove the responsibility of lighting Chanukah candles in one's home as well. Q: What is the meaning of pirsume nisah? A: Pirsume nisah is an Aramaic phrase that the sages in the Babylonian Talmud tell us is to: "Proclaim in public the miracle" that occurred to our forefathers on Chanukah. This is why we put the menorah in the window, so that anyone that passes by will see it. This accomplishes the intent of pirsume nisah, which means publicly proclaiming the miracles. Q: How do we light the candles? A: We begin by placing our oil or candle to the far right. The "newest" candle or wicj always should be added to the left of the candle we lit the previous night. The candles or wicks should be in a straight line, not in a circle; one may not be higher than the other. This excludes the shamash candle, which is placed either higher or lower than the others. The Chanukah candles are lit using the shamash. We always light the new wick or candle first, lighting from left to right. Q: What do we do first, recite the blessings or light the candles? A: Two blessings are recited first, then we light the candles. Q: What is the difference between the first night and the rest of the Chanukah festival? A: On the first night, we add the Shehechiyanu blessing, reciting three blessings instead of two. The Shehechiyanuis said to offer thanks to the Almighty for sustaining us and allowing us to reach this occasion. Q: Why is it customary to eat dairy food on Chanukah? A: Dairy dishes are eaten during Chanukah to recall the story of Judith and Holofernes, a Greek general. According to tradition, Judith gave Holofernes milk to drink and cheese to eat. This caused him to fall asleep, and while he slept, Judith killed him, thereby saving the Jewish people from Nebuchadnezar, king of Assyria. Q: Why is it customary to eat food cooked with oil on Chanukah? A: To remind us of the miracle of Chanukah that was the oil that burned for eight days instead of just one. We eat potato pancakes or donuts fried in oil. We hope and pray that G-d's kindness and grace will be with us always. Q: What is a dreidel? A: A dreidel, in Hebrew a se-ve-von, is a four-sided top. Each one of the four sides has a Hebrew letter: nun, gimel, hay, shin (or pay). Q: Why do some dreidels have a shin while others have a pay? A: In Israel, dreidels have a pay, which stnads for the word "here". So the phrase attached to the Israeli dreidels isNeis Gadol Hayah Po or "a great miracle happened here". But in lands outside of Israel, the shin is used which stands for the word sham meaning "there". So the phrase would be Neis Gadol Hayah Sham meaning "a great miracle happened there (Israel)". Some communities use both types of dreidels. The one with the shin referring to events that happened in the past (there) while the pay refers to events in our days and the fact that we live by the grace of G-d and His miracles. Q: What was the inspiration of the dreidel games? A: King Antiochus forbade the Jewish people from following Torah law. Refusing to obey Antiochus's decree, Jews studied the Bible in secret. Whenever a soldier would come by, the holy books were quickly hidden away anddreidels were taken out so that the students appeared engrossed in a game of spinning tops. The word Chanukah comes from the Hebrew word chinuch meaning "education". We educate children even when they play. When they ask us what the Hebrew letters on the dreidel mean, we recount the miracle of Chanukah. We cannot predict on which letter the dreidel will land. Much like life, sometimes we feel that we are going in circles, with no direction, unable to predict and outcome. It is our belief in G-d that gives direction and purpose to our life. Q: Why do we light candles for eight days instead of seven? A: The priests said that only pure olive oil was to be used to light the Menorah. If there was no other choice then one could use impure oil. There was only enough pure olive oil for one night, and they were planning to use impure olive oil for the second night. The miracle was that the pure oil burned for and additional seven days, equaling eight. Therefore, instead of lighting for seven nights, we add an eighth candle to symbolize G-d's grace. (Babylonian Talmud, Sabbath 24; P'net Yehushuah). Under the Greeks, Jews were forbidden to circumcise their sons. When the Maccabees emerged victorious from their war with the Greeks, the Jews once again began living their traditions in the open. Circumcision was one of the commandments that was banned. As we know, circumcisions are performed on the eighth day. So in commemorating the fact that we were again performing circumcision at the correct time, we light the Chanukah candles for eight days. Q: Why is it customary to give money to children during the festival of Chanukah? A: Money is given to children as a reward for their learning Torah. At the time of the Maccabees, children learned in secret the great risk to their personal safety. The money given is referred to as Chanukah gelt, money of Chanukah. It usually is given on the fifth night because there are more candles lit than unlit. Chanukah is an educational festival. We give our children money so that they may buy games and books that teach them about our history, heritage, and tradition. Q: Why and when do we say the additional prayer of haNisim, "For the Miracles"? A: The sages established this special prayer to than the Almighty for the miracles He performed in the Temple. The prayer briefly describes the story of the Maccabees. It is inserted in the Amidah prayer of the three daily prayer services. It is also included in the blessing after the meal. Q: What exactly do we say in the haNisim prayer? A: "For the miracles, for the liberation, and for Your special actions and for the conquest which You performed, for our ancestors in those days and in our time. In the time of Matityahu, son of Yochanan, the Hosmonean. When the evil Greek kingdom forbade, through a royal decree the people of Israel from studying Torah, to make them forget their teachings and thereby force them to stray from the law of G-d. You, G-d, with full compassion and mercy helped them in the time of their agony and torture. You heeded their complaint, made justice, and took revenge upon their enemies. You gave the wicked hand into the pure hands, the hands of the numerous to the hands of the few. The hand of the unclean into the hand of the uncontaminated. The evil into the hand of the pious. And the careless into the hand of Your disciples of Your Torah and this made You great L-rd and holy into the universe and for the people of Israel. You made a great redemption and victory as You did from there through our days. After that, the Hasmonean came to the Temple, cleansed your house, and purified the Holy of Holiness and Your children light the candles in Your shrine. And from that day they instituted the festival of eight days, which is called Chanukah, to signify special appreciation and thanks for Your grace and holy Name." Q: Why is it customary on Chanukah to give charity? A: The giving of charity, tzedakah, shoes that we are truly grateful to G-d for all that he has done for us. Children should be encouraged to give some of their Chanukah gelt as tzedakah so that they can be instilled with the desire to give charity. Q: Jewish history is full of wars and miracles. Why do the sages decree that we celebrate the festival of Chanukah and Purim? A: Both of these holidays celebrate the defeat of our enemies who tried to totally destroy our past and future. The sages want us to learn from the past and to teach future generations about the unique miracles performed for us. We are to appreciate those miracles as if they occur in our own day. Q: What are the main differences between Chanukah and Purim? A: Both festival recall attempts to destroy the Jewish nation. Chanukah represents victory in a spiritual and cultural war, when the Greeks wanted to convert Jews and worship multiple gods. Purim represents a physical victory over Haman's plot to kill off the entire Jewish population.